JKPSC Recruitment 2018 – Candidates who are seeking government jobs, there is a good news for them. Jammu and Kashmir Public Service Commission has issued notification for Medical Officer Vacancies. Only Permanent Resident of Jammu and Kashmir can apply for 1000 Vacancies. Online Registration for JKPSC Vacancy is started from 16 October 2018. Candidates may fill up their application form before last date 15.11.2018. The Department is organize written the examination for appointing applicants on Medical Officer Post. Here we provided you complete information regarding Jammu & Kashmir PSC Jobs 2018. What Are The Important Date For JKPSC Jobs 2018? What is the Important dates For JKPSC Vacancies – Consultant Bharti ? How I Check Pay Scale, application Fees & Selection Criteria For JKPSC Jobs 2018 ? What is the Pay Scale For JKPSC Consultant Vacancies 2018 ? How Can I Fill Online Form For JKPSC Recruitment 2018 – Consultant Online form ? Fresh Update as on 15.11.2018:Today is the last date for online registration for JKPSC Recruitment 2018. Candidates must fill up their form as soon as possilbe for Medical Officer Vacancies. Participants can apply online form links given here. 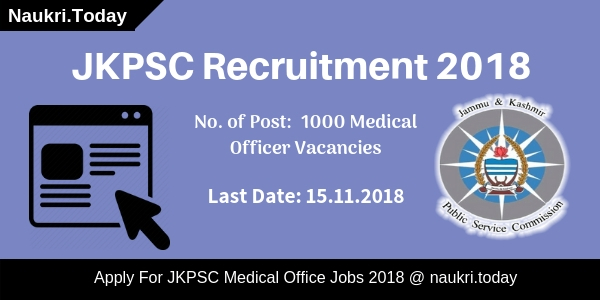 Fresh Update as on 30.10.2018: JKPSC Recruitment 2018 is available for 1000 Medical Officer Vacancies. Participants should check here qualification, age, and much more for JKPSC Vacancy. Here we gave you links to apply for Medical Officer Posts. Participants should fill up their application form carefully otherwise their form will be rejected. Candidates should check here eligibility criteria for JKPSC Vacancy 2018. Candidates may download JKPSC Notification 2018 either from here or from official Website. Participants must have a Degree of MBBS and Possession of recognized Graduation Medical Qualification from recognized University. Candidates may pursue their qualification in the 01st & 2nd Schedule or Part-II or III Schedule are eligible for JKPSC Recruitment 2018. Applicants should read official JKPSC Notification 2018 for further more details regarding qualification. the Department should set 18 years as minimum age and 40 years as the maximum age for JKPSC Medical Office Recruitment 2018. Candidates with physical Disability are relaxed by 2 years. Participants of SC/ST/RBA/ALC/SLC category is relaxed by 3 years and Ex-Service Man by 8 years. For further more details candidates should check Official notification of Jammu & Kashmir PSC Jobs 2018. The Department will pay Rs. 9300/- – Rs. 34800/- With Grade pay of Rs. 5400/- to the selected candidates for JKPSC Recruitment 2018. Candidates must prepare hard to grab JKPSC Medical Officer Jobs 2018. Participants should be selected on the basis of written examination for Medical Officer Posts. The level of Examination will be NEET (PG) level. It contains 100 multiple choice questions of 100 Points. Applicants should consult to official JKPSC Notification for more details regarding selection criteria. Applicants of General category should pay Rs. 400/- as an application fee for JKPSC Vacancy 2018. Candidates who belong to Reserved category will pay Rs. 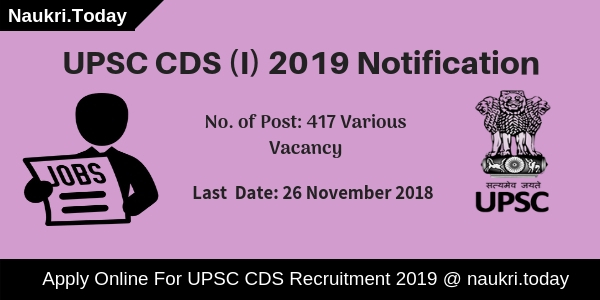 200/- For Jammu & Kashmir PSC Recruitment 2018. Participants are informed that Application fee is not refundable in any case. Read Official Notification carefully for more details regarding JKPSC Medical Officer Jobs 2018. Participants should follow these steps to apply for JKPSC Recruitment 2018. 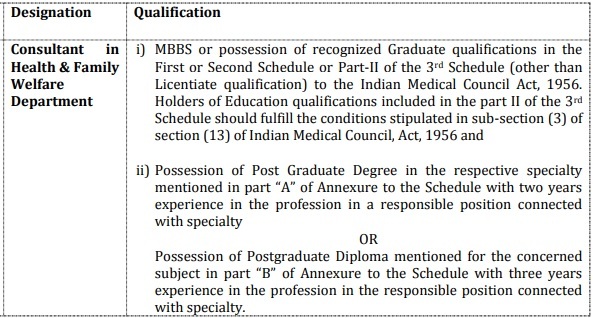 Before applying candidates should check eligibility criteria for Medical Officer Posts. Here we gave you complete information related to JKPSC Medical Officer Jobs 2018. Participants should log on to official Website of Jammu & Kashmir PSC i.e jkpsc.nic.in. Candidates may search for JKPSC Recruitment section at Homepage. Eligible Candidates may apply online for Medical Officer Posts. Candidates may insert their photo and signature in an application form. After that pay your application fee according to their category. Now Submit your application form for registration. Conclusion: Jammu and Kashmir Public Service Commission has a notification for 1000 Medical Officer Vacancies. Interested candidates may check here qualification, age, and application fee for JKPSC Recruitment 2018. Here we gave you links to apply online for JKPSC Vacancy 2018. Dear Applicants, Jammu & Kashmir Public Service Commission has issued notification for filling 95 Consultant Vacancies under Health & Family Welfare Department. This is the great job opportunity for all the candidates of Jammu & Kashmir who are searching Jobs. Interested candidates can fill the application form for JKPSC Recruitment 2018 through online mode here. You can submit JKPSC Consultant Jobs online form till the last date 16.04.2018. Rest of the details related to Jammu & Kashmir PSC vacancies you can check from below article. JKPSC Jammu & Kashmir is inviting online form for appointing qualified candidates for Consultant Vacancies. Submission of online form for JKPSC Vacancies will start from 15.03.2018. Applicants who are going to fill online form must check JKPSC Jobs Details & Eligibility criteria before submitting the online form. Full details about Education, Age & Other details you can collect by reading the below section. Applicants, here we are providing Discipline wise division of JKPSC Vacancies in the below section. You can collect more details related to distribution of Jammu & Kashmir PSC Vacancies from official notification. Candidates can check post & Discipline wise required eligibility Criteria For JKPSC Vacancies 2018. 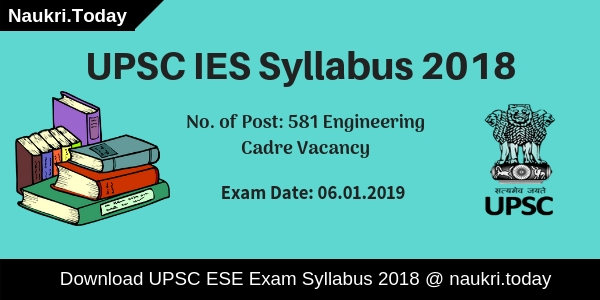 Check Required Education & Age Criteria For Jammu Kashmir PSC Vacancies you can check from below sections. Minimum age of the candidates for Jammu & Kashmir PSC Vacancies must be 21 years & Upper age must be 40 years as on 01.01.2018. Relaxation in age for JKPSC Vacancies is applicable as per department rules & regulation. Selected candidates for JKPSC Recruitment 2018 will paid pay band of Rs. 15,600/- to 39,.100/- with grade pay Rs. 6,600/- per month. For more details about Pay scale you can read the official JKPSC Jobs Notification. Candidates of General category need to pay Rs. 805/- as application fees for JKPSC Consultant Vacancies 2018. Reserved category candidates must paid Rs. 405/- for applying online form for Jammu & Kashmir PSC Jobs 2018. Fees must be deposited through online mode only. Selection of the candidates for Jammu & Kashmir PSC Vacancies will made on the basis of Interview. More information about Interview/ Examination you can check form official notification. Eligible & Interested candidates can fill online form for JKPSC Vacancies 2018 from here till the last date. Read the below steps which is helpful for filing online form JKPSC Consultant Vacancies. First of all candidates visit to the official website www.jkpsc.nic.in. Now click on Advertisement Link & read JKPSC Notification link. Fill all details in JKPSC Online form. Upload your Photo & signature in form properly. Deposit application fees before submission. Recheck all details filled in form. Conclusion : JKPSC Recruitment 2018 For 95 Consultant Vacancies. Candidates can fill online form JKPSC Vacancies 2018 on or before the last date 16.04.2018. Check more details about Jammu & Kashmir PSC recruitment you can collect by reading the above article. Are you searching for JKPSC Recruitment 2017 notification ? If yes, then you may rest your searches here. Recently, Jammu & Kashmir Public service Commission has released JKPSC Vacancy 2017 for total 563 vacant posts. The applicants who are interested for JKPSC Assistant Professor Jobs can apply through online mode from here. Candidates who want to apply for Jammu & Kashmir PSC Recruitment should fill application form latest by 28th November 2017. Aspirants will get complete details for PSC Jammu & Kashmir Vacancy 2017 from here at naukri.today. Jammu & Kashmir Public Service Commission generally known as JKPSC, the department has published JKPSC Recruitment 2017 notification on its official website. This is the good opportunity for the contenders who are looking forward in teaching sector. The applicants who are interested can apply for JKPSC Vacancy can apply now as the registration process is still going on. Candidates will get the information like eligibility criteria, pay scale, application fee etc in the given article. Contender must have good academic records with minimum 55% marks from recognized University for JKPSC Vacancy 2017. Those candidates who belongs to other category should have good academic records with at least 50% marks for JKPSC Assist. Professor Jobs. Participants should have passed NET/ SLET/ SET organized by UGC, CSIR/AIU for JKPSC Recruitment 2017. Applicants can referred JKPSC Jobs advertisement for the detailed information related to educational qualifications criteria. Candidates who wish to apply for Jammu & Kashmir PSC Jobs should be in the age group of 18 years and 40 years. The applicants who are belong to RBA/ SC/ ST/ ALC/ SLC will gat age relaxation of 3 years and PH candidates will have age relaxation in upper age limit for 2 years and 8 years in the case of Ex-Serviceman. Participants who will be filling application for JKPSC Vacancy need to pay the application fee. Unreserved category applicants have to pay Rs. 805/- and candidates from other category are supposed to pay Rs. 405/- as registration fee. The applicants who will be selected for JKPSC Recruitment will get good amount of salary. Candidates will get pay scale as Rs. 15600/- to Rs. 39100/- along with 600/- as grade pay. Jammu and Kashmir Public Service Commission will be conducting Written Exam and interview to select the applicants. The Participants will be shortlisted on the basis of their performance in the Written Exam and interview . Candidates who will be qualifying the Written test will be considered eligible for Interview. The applicant who qualifies all the levels will be eligible for Jammu and Kashmir PSC Jobs 2017 – 18. Then, you have to search for “JKPSC Recruitment 2017” notification pdf. Now, you have to read the complete notification for Jammu and Kashmir PSC Jobs. If you are eligible for PSC Jammu & Kashmir Vacancy fill application form. Now, upload your scanned photo and signature of the applicant. Then, recheck all the details and pay the application fee. Candidates are supposed to send the application and other required documents to the below mentioned address. You can keep a copy of the application form for future use. Download the Jammu & Kashmir PSC Vacancy 2017 notification pdf. Conclusion : JKPSC Recruitment 2017 – 18 notification is published on its official website for filling up total 563 Vacancies. The applicants who are interested can apply for JKPSC Vacancy can apply for Assistant Professor position. Candidates should submit the application form JKPSC Jobs latest 28th November 2017. You can stay connected with our portal for all the latest updates regarding Jammu & Kashmir PSC Recruitment 2017.